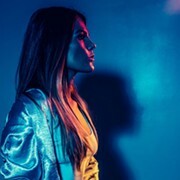 Once voted "Best Singer" in Scene's Best of Cleveland campaign and a regular nominee in the Ohio Hip Hop Awards, local soul singer Lauren Lanzaretta generated plenty of hype with her full-length debut, last year's Naked Soul. Recorded locally at Lava Room Recording, the debut hits the mark right from the start. Now, Lanzaretta has just filmed a new video for her upcoming single "See To Believe" which is the first single off her upcoming EP. She and a group of dancers performed at the Michael J. Zone Rec Center where Lanzaretta, a talented basketball player who played for her high school team, dribbled and shot hoops during the filming. She says the video is about her two loves: music and basketball. The single and official music video will come out in late January. You can see what when on behind-the-scenes during the shoot in this video she's just posted on YouTube. Speaking of Lauren Lanzaretta, "See To Believe"